Event is FREE and begins at 1:00 PM in the Arroyo Grande Village. The 2018 Arroyo Grande Village Summer Concert Series kicks off its lucky13th season on June 10th with classy vocals from Nicole Stromsoe and her talented all-star band. 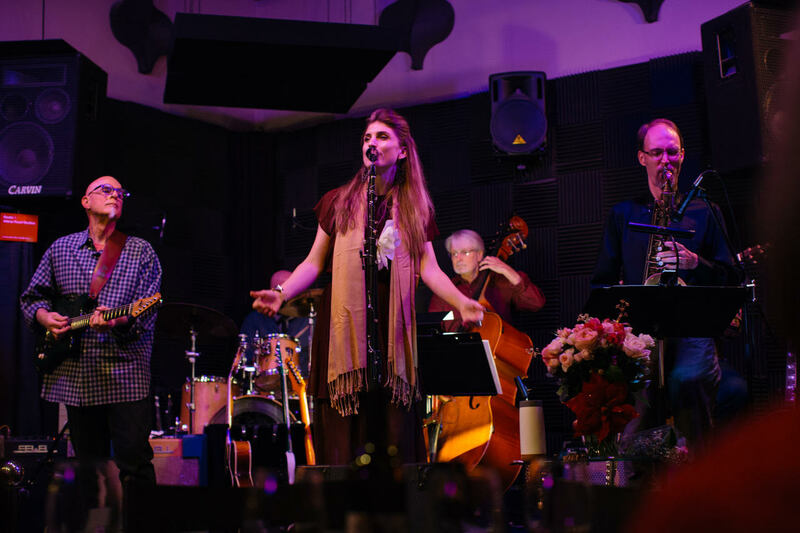 Join your friends at 1:00pm at the Rotary Bandstand in the Village of Arroyo Grande to listen to this intriguinging group of Central Coast musicians playing jazz, folks, blues and soul. Activities during the day will spotlight the concert sponsor Wyndham Residence and the featured nonprofit the Elm Street Dog Park. 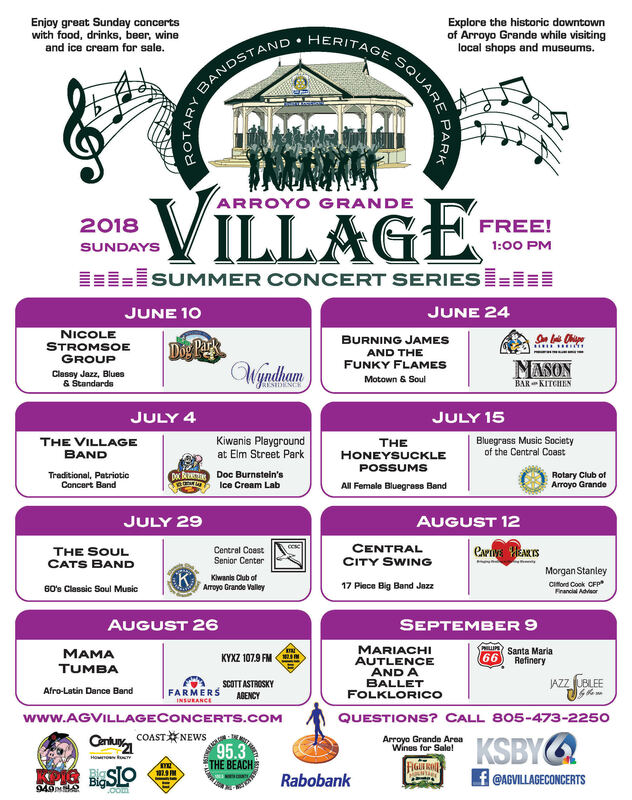 The Arroyo Grande Village Summer Concert Series is known for presenting the most eclectic and diverse musical offerings of all the regional summer concert series. A fun raffle, food, drinks and free tours of historical buildings in Heritage Square Park are also available. Figueroa Mountain Beers and Arroyo Grande Area Wines will be available for sale for the first time this year. This free Series is presented by the Arroyo Grande Village Improvement Association and the City of Arroyo Grande Recreation Services Department. Rabobank again joins these organizations as the Featured Series Sponsor. 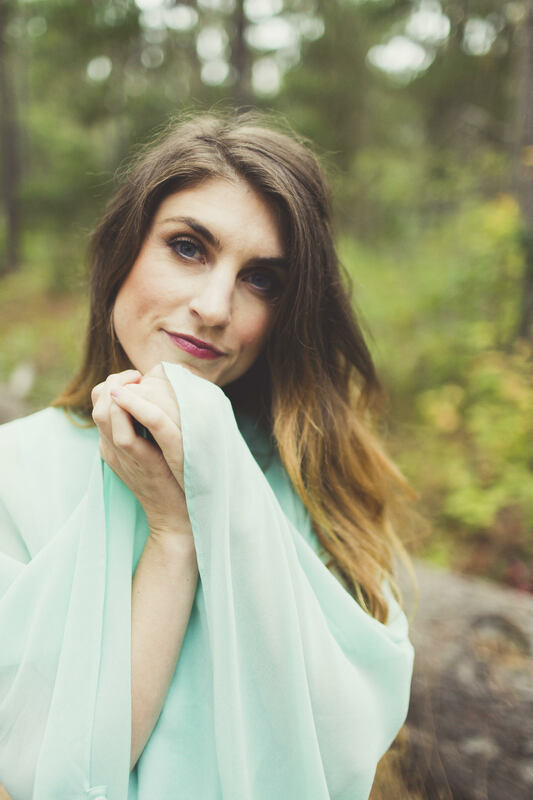 Performing an eclectic repertoire of old R&B soul, jazz, rich folk & blues (originals as well as standards), Nicole Stromsoe’s voice has been described as nourishing, sensual, and rich in quality. With clarity and presence, she shapes a distinctive experience for her listeners. Songs range from Ruth Brown’s material of the 1950’s, songs by treasured writers such as Kate Wolf and John Prine, jazz standards, and Nicole’s own originals. Nicole is a graduate of the prestigious Berklee College of Music in Boston, and will be joined by well known Central Coast talents Dorian Michael (guitar), Ken Hustad (bass), Paul Griffith (percussion) and Dean Giles (drums). The featured nonprofit organization for this show will be the Elm Street Dog Park. 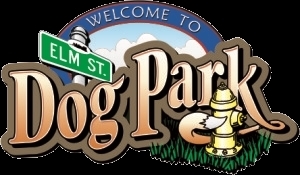 (ESDP) The park is a fenced, off-leash park located at Elm and Ash Streets in Arroyo Grande. There are separate sides for both large and small dogs. The Board of Directors operate as a 501(c)(3) under the umbrella of the San Luis Obispo Parks, Open Space and Trails. The ESDP Association leases the land from the City of Arroyo Grande. Care and maintenance of the yards, benches, gates, fences, and supplies needed are provided by volunteers and donations. The Concert Sponsor for this show is Wyndham Residence, an independent and assisted living facility located in beautiful Arroyo Grande. Residents experience a wealth of recreational activities and fine dining as well as privacy and security in its charming resort-like campus. Wyndham is owned and operated by long time VSCS sponsor Compass Health, the largest provider of assisted living services in San Luis Obispo County. Employees from the overall series sponsor Rabobank will be on hand at the show. Rabobank has supported the Village Summer Concert Series since its inception in 2006 and its charming representatives greet concert attendees at every show with smiles, free waters and surprises! Major media sponsors for the 2018 Series are KSBY-TV joined by new radio sponsors: 95.3 The Beach & 94.9 KPIG. Additionally the series receives promotional support from Big Big SLO, the Five Cities’ community radio station KYXZ 107.9FM and the family of Simply Clear Marketing newspapers: the Coast News, the Avila Beach News and the Bay News. The South County Historical Society’s famous all beef hot dogs, Doc Burnstein’s ice cream novelties, popcorn, drinks and more are for sale at the shows. New this year: Figueroa Mountain Beers and Arroyo Grande Area Wines will be sold to benefit the Arroyo Grande Rotary Club and the Historical Society. In a short five years, “Fig Mountain” has become one of the fastest growing craft breweries in America. The Brewery offers six taprooms on the Central Coast including their Arroyo Grande location on East Grand Avenue. Talley Vineyards will offer the featured wines at the June 10th show. The family owned winery specializes in estate grown chardonnay and pinot noir and its tasting room is located on Lopez Drive five miles east of Arroyo Grande. These free summer concerts are held at the Rotary Bandstand in Heritage Square Park from June through September. Special raffles benefitting the Featured Nonprofit Organizations and various displays will further enliven the concerts. Music fans can also explore Heritage Square Museums, antique shops and restaurants in the historic Arroyo Grande Village. Attendees are asked to bring lawn chairs, blankets and their friends and neighbors to enjoy the afternoons under the sun! Refer to www.facebook.com/AGVillageConcerts and AGVillageConcerts.com or call 805-473-2250 for more information on the Village Summer Concert Series and the VIA’s other community events.